When I boarded the airplane to Bristol at the Edinburgh Airport in September 2017, I’d been thinking about the perfect week spent in Scotland, hoping I could visit the country again. Who knew I would be on Scottish soil before hitting the year-long mark! “We must visit Scotland. I want to show your mother around Edinburgh and Glasgow,” my father had said, as we settled in for the long flight to Heathrow, London. This was June 2018 and our destination was my elder sister’s home in Bristol for a much needed family vacation. My father had visited parts of United Kingdom way back in the 1980s. So there was quite a long list of ‘places we could visit’ being made. Scotland topped this list and keeping this in mind, after two days of extensive internet combing for suitable places to stay and affordable air tickets, the parents and yours truly were finally heading to Edinburgh. “It’s been 30 years since that first visit. I was younger and with friends. Wonder how much has changed and how much we’ll be able to see,” mused my father as the parents peeped out of the airplane window, taking in the aerial view of Edinburgh. We had three days – 0.5+1+1+0.5 – to see as much of Scotland as one could without affecting the parents’ health – both are senior citizens – and compromising on the experiences. And we managed it quite beautifully if I may say so! The trick was to make a flexible schedule and that is what we did! Here’s the programme the parents made – and almost followed – for the first day and a half when they got a feel of Edinburgh and visited Glasgow. # Fly into Edinburgh by late afternoon; this leaves time enough for a breather before heading out to take in the city lights. The best way to travel into the city from Edinburgh Airport is the Airlink Bus. Buy tickets for a return trip – they are cheaper. Splurging on a taxi ride is another option. # Check in, power nap, a cuppa later, take a taxi to the Royal Mile. A set of streets in the heart of the Old Town of Edinburgh – Castlehill, the Lawnmarket, the High Street, the Canongate and Abbey Strand – the Royal Mile is a must visit for all tourists, irrespective of age. Disembark at Castlehill and stroll up the Royal Mile towards Edinburgh Castle. Walking along the Royal Mile at 8.30pm on a week night. # Walk into the Camera Obscura for a fun filled evening. One of the few tourist attractions that keeps its doors open well into the evening – 9am to 10pm (local time) – it’s a converted observatory with six floors of exhibits. With a rooftop view of the city that is unbeatable and exhibitions of optical illusions, puzzles, a mirror maze, this one is for all ages. Don’t miss the Camera Obscura show. # End your evening with dinner in one of the pubs along the Royal Mile. Or take a taxi back to your hotel – ours was in Haymarket – and find a place to dine nearby. We opted for dinner at an Indian restaurant that was a 10 minute walk from our hotel. Tucked in and strolled back to the hotel… a perfect end to the day. # Begin the day with a hefty traditional Scottish breakfast of black pudding, Lorne sausage, bacon, tattie scones with grilled tomatoes and oatcakes. If you prefer to travel light, then have a quick brekkie of the traditional Scottish porridge. # Day 2 is for Glasgow! Head to the nearest railway station – Waverly or Haymarket – and book ‘off peak’ tickets for Edinburgh-Glasgow-Edinburgh. Check with the information desk at the railway station for discounts; the Scotrail has different discount schemes on tickets. We got a group discount fare for three people. 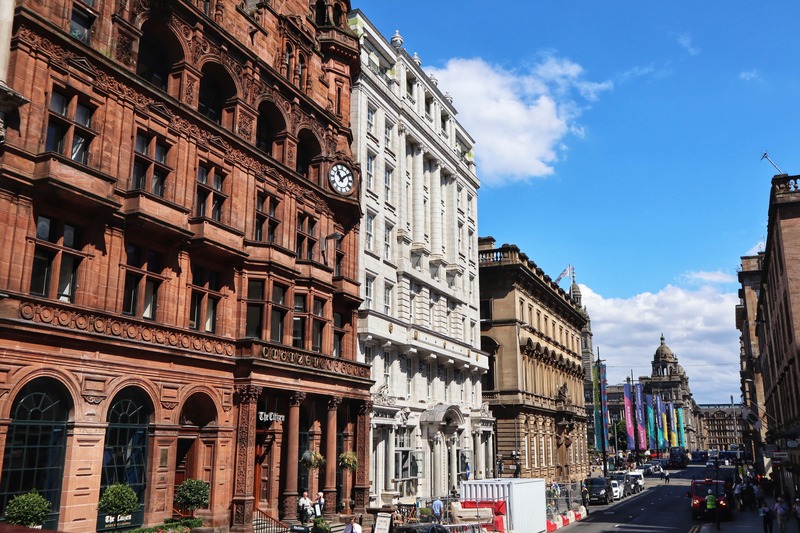 # From Glasgow’s Queen Street Station, walk towards the gorgeous George Square and spend some time with the pigeons that hop and skip around the square. Gaze up at the statues of Scotland’s national poet Robert Burns, novelist/ playwright/ poet/ historian Sir Walter Scott, inventor/ mechanical engineer/ chemist James Watt and others at the square corners. With the iconic Glasgow City Chambers dominating one side of George Square, you can go on a photo clicking spree to capture the sights of the ornate buildings around. # Grab a seat in a city sightseeing tour bus. As it drives through the streets of Glasgow, allow the commentary (live or pre-recorded) to envelop you in the spirit of this industrial city. It’s best to hold on to the tickets of the tour that allows you to hop on and off as per convenience. Keep your eyes open for the riveting street art. # Done with the tour? Hop off at George Square again and stroll along Buchanan Street for a lunch at a nice little coffee shop or the Willow Tea Rooms if they have space. The parents weren’t too hungry so we popped into a Starbucks for a quick coffee and snack, pouring over the sightseeing tour plan to tick places they wanted to check out. Saunter back to the closest tour bus stop and jump right back in. The buzzing Buchanan Street is the home of brand stores. Note: If you are concerned about accessibility of a place, then check with the tour bus driver or guide. My parents find long walks and steep climbs tiring. So we skipped places like Glasgow Necropolis, Gallery of Modern Art and The Lighthouse. Since we wanted to return to Edinburgh well in time for dinner, the parents visited only sites they deemed interesting. # Enter your first stop, the Glasgow Cathedral. The Glasgow Cathedral has not held the status of being a cathedral since 1690 but is still a place of worship for several. A classic example of Gothic architecture – a feature prominently seen in Scotland – the cathedral is dedicated to Saint Mungo, the founder and patron saint of Glasgow. Highlights of this cathedral are the interiors that ooze a spiritual calm. If time permits, pop into the St Mungo Museum round the corner. # The parents were very keen on visiting the People’s Palace, a glass house and museum with exhibits detailing the social history of Glasgow. But as luck would have it, they were unable to reach this tourist spot despite walking for nearly 30 minutes through a maze of road blocks. The road blocks had been set up as part of the work following the blaze at Glasgow School of Art in June this year. The walk led to throbbing legs and wasted time. Moral of the story: Always check with the bus driver and recheck with the guides for the best way to reach a destination. While you and I can waltz around and bounce back, it might be a bit difficult for those older in age. A view of Glasgow from the bus top. #If you are a fan of museums, you must step into the Riverside Museum and Kelvingrove Museum. Winner of the 2013 European Museum of the Year, the Riverside Museum houses the collection of the Glasgow Museum of Transport. The Kelvingrove Museum, meanwhile, is one of the grandest museum buildings in the Scottish lands and houses a large selection of works by prominent artists like Rembrandt van Rijn, Claude Monet, Vincent van Gogh and Salvador Dali among others. The original facade of the Glasgow Central Station. #Take a bus back to the Queen Street Station for your train back to Edinburgh. Do note that there are two paths leading out of the station – check with the information desk or ask a person in uniform for the way out towards George Street. Come back next week for the schedule of the second day and a half when the Highlands were visited and Edinburgh toured before the flight back to Bristol.